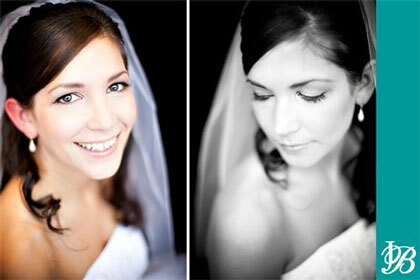 One of the most popular trends in bridal hair today is the half-up/half-down hairstyle. Perhaps it's because it brings the best of both worlds: the sophisticated formality of an up-do and the romantic, flowing look of loose locks. A waterfall of cascading curls adds an extra "wow" factor to this half-up hairstyle. Strands are gathered from the front of the hair in sections to create a "piece-y" look, while extra volume at the crown also prevents the style from looking flat when seen in front. 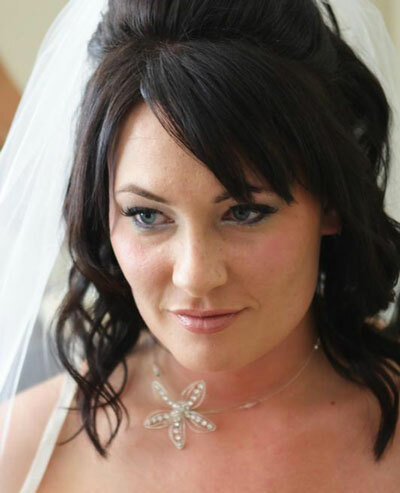 The great news for brides hoping to have the half-up 'do on their big day is that it can be achieved with locks in a variety of lengths - from just-above-the-shoulder medium-length hair, to ultra-long hair. The half-up can also be worn with bangs, whether short and side-swept or long and shaggy - as well as without bangs, in which all of the hair from up front is swept up to the crown, creating a regal look. Although it's best not to pile on too many accessories at once, there is still a huge variety of pins, barrettes, and clips to choose from that look perfectly pretty when placed in a half-up hairstyle. 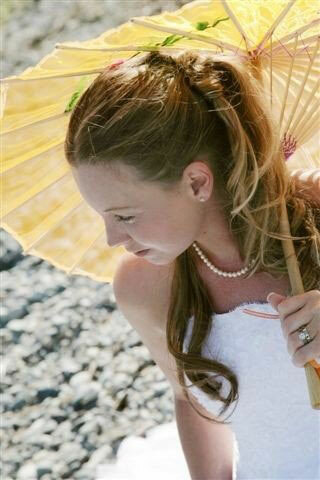 Whether it's a large flower pinned behind one ear, tiny buds scattered throughout tousled tresses, or even a tiara, there is so much to choose from in the way of accessories to complement the half-up wedding day hairstyle. The following photos feature a diverse series of creative hairstyles in the half-up genre to suit your style. Some are sleek and sophisticated, while others are wavy and romantic, or a bit shorter and sassy. 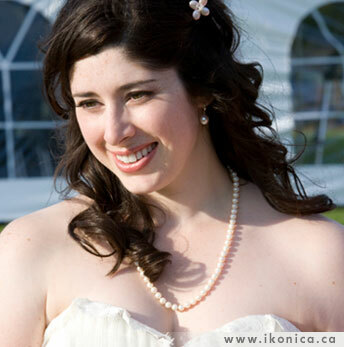 As you can tell from this photo, the half-up 'do is perfect for an outdoor wedding when curls are let loose and natural (a breezy beach in particular will tousle your tresses anyway!) 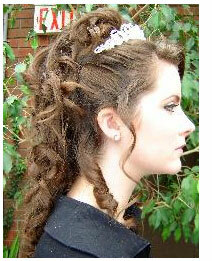 For this look, the hair in front is combed gently up to the crown, where it's looped and secured with bobby pins. The rest flows down naturally, and is lightly curled at the ends. 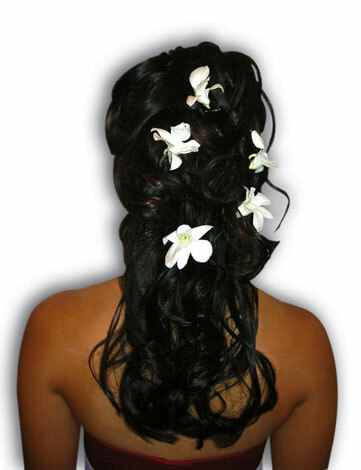 Flowers scattered in the back of the hair add a breathtakingly exotic element to this half-up style. For the bride who wants extra oohs and ahhs on her walk down the aisle! The half-up do styled on shoulder-length hair creates an especially sweet yet sassy look! Piece-y bangs swept to the side frame the bride's beautiful eyes, while the bouffant makes a perfect crowning touch for the veil. An extreme side-part in the front adds sleek sophistication to this half-up hairdo. 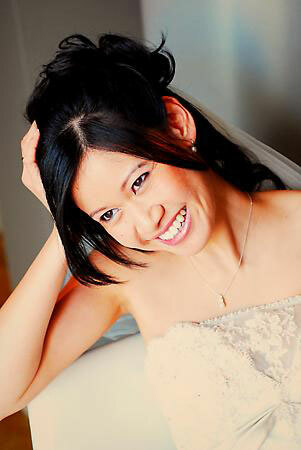 Loose tendrils that have been gently curled make this an especially romantic hairstyle when worn with a veil. The half-up 'do looks ultra-modern when slightly messy and tousled, and added volume at the crown creates a complementary retro "bouffant" twist. Baby bangs with a side-sweep also add a face-framing touch. 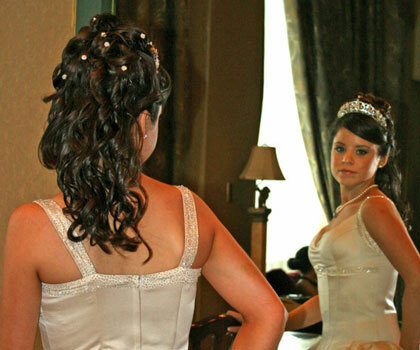 A tiara can transform the half-up do into an especially formal coif, fit for a princess! Lots of curling is required to achieve this style, as well as small rosebuds in the back to add more finishing touches. Extra-long, side-swept bangs add a soft touch to this half-up do, while the hair secured at the crown is pinned into a playful, curly ponytail. As you can see from this photo, the half-up hairstyle isn't just for super-long locks - the bride's medium-length hair is secured at the sides with a perfectly pretty flower pin. Side-swept bangs also add a touch of girlish glam to the half-up 'do. 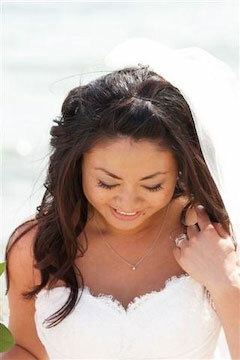 This look has the natural, loose waves of a "hair down" 'do without obscuring the bride's face. The hair in front is gathered to the crown, where it's secured with bobby pins so the bride doesn't have to sweep stray strands away from her face. Check out the other stories in this "Bridal Hair 101" series (listed below) or browse Hair and Makeup Artists near you, in our Directory.